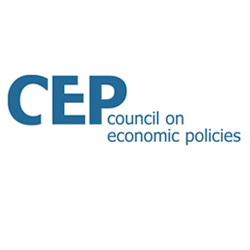 CEP is an international nonprofit nonpartisan economic policy think tank for sustainability. We formulate and promote economic policy solutions that strengthen individual opportunity, social cohesion and environmental stability. We pursue goals, not ideologies; we believe in the effectiveness of markets as well as in the need for appropriate policy frameworks; and we focus on bold but pragmatic and concrete steps rather than grand redesigns. Our impact is reflected in policy change. To target our objectives, we leverage existing analysis, fill research gaps and translate our findings into policy recommendations across three fields: fiscal, monetary and trade policy. We promote our ideas to policymakers, journalists as well as academic and policy communities on a national and international scale. We engage with them through direct meetings, events, the media, policy papers, other publications, and online communities. We also collaborate closely with third parties and support the launch of new organizations to build alliances and increase impact.